Another member of the Glues Brothers…. artist Thomas Weber creates amazing new designs… like this one that was inspired by 1978’s Battlestar Galactica! 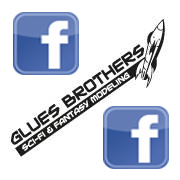 To visit the Glues Brothers FaceBook site direct, please click the banner link below.